Regulated rail fares in England and Wales and regulated peak-time fares in Scotland will rise by 1.9% next year. The rise, determined by July's Retail Prices Index (RPI) inflation measure, will take effect from January. It comes as research by trade unions suggests rail fares have increased at double the speed of wages since 2010. But the government said wages were now rising faster than fares, and the rail industry said £50bn was being spent on improving the network. Ministers have said previously that regulated fares will rise by no more than RPI for the rest of this Parliament. About half of rail fares in England and Wales are regulated, including season fares on most commuter journeys, some off-peak return tickets on long-distance trips and "anytime" tickets around major cities. In Scotland, the 1.9% rise applies to regulated peak-time fares (including season tickets), but regulated off-peak fares will only rise by 0.9%. At the beginning of 2016, the cost of regulated fares went up by 1% in England, Scotland and Wales. Northern Ireland is treated separately. In March, Stormont announced public bus and rail fares would not rise this year. While the government sets the cap for the rise in regulated fares, unregulated fares, such as off-peak leisure tickets, can go up by as much as train companies wish. Reality Check: Have rail fares risen twice as fast as wages? TUC general secretary Frances O'Grady said rail passengers were "paying more and getting even less", and called for rail services to be nationalised. The government said standards were improving and commuters were now getting a better deal. "Wages are growing faster than train ticket prices thanks to action by the government, and our commitment to cap regulated rail fares in line with inflation will save annual season ticket holders £425 on average in the five years to 2020," said Rail Minister Paul Maynard. Paul Plummer, chief executive of the Rail Delivery Group, which represents the rail industry, said: "We need to sustain investment to build a modern railway, and money from fares helps us to do this." He said "nobody wants to pay more" to travel to work, and he understood the frustration in areas where people "aren't getting the service they are paying for". But he said passenger numbers had "doubled in two decades", creating strain on the railway network, and £50bn was being spent "over the next few years to upgrade it". He said this would improve reliability, connectivity and ensure more passengers got a seat. The Campaign for Better Transport, which said the latest increase was a "real slap in the face to long-suffering commuters", reiterated its call for RPI to be scrapped as the measure for fare increases. It said the government should switch to the Consumer Prices Index (CPI) figure, which is already used for pensions and most benefits. RPI "consistently over-estimates inflation", and using CPI would "help tackle soaring ticket prices and have only a minimal impacts on revenues", it said. CPI is almost always lower than RPI, mostly due to the different formulae used to calculate them. RPI includes housing costs such as mortgage interest payments and council tax, whereas CPI does not. Student nurse Diane Cawood, 31, from Salford in Greater Manchester, said: "I get a bursary of £457 a month to live on. "My most recent placement was 10 weeks and it cost me £200 a month to commute there on a train which was often late and packed to the rafters with other commuters. "I worked out that if I passed my driving test and bought, taxed and insured a car as a newly qualified driver, it would still cost me far less than the train. Public transport is supposed to be the cheaper option." Andrew George Simpson, 28, a chef from Larkhall in South Lanarkshire, said he "could not disagree more" with the government's claim that commuters were now getting a better deal. He said conditions on his daily commute to Glasgow were "horrendous" and trains were frequently delayed or cancelled with little information given. Keith Shepherd, 53, a business analyst from Dartford in Kent, said delays on his regular route were "considerably worse than in the bad old days when season ticket prices were reduced to compensate passengers for 'poor' performance". He added: "My journey has to be delayed by more than 100% of the expected journey time in order to receive any compensation, and even then they use ridiculous calculations to minimise the amount they have to pay." Manuel Cortes, general secretary of the Transport Salaried Staffs' Association, said private profit was being placed above rail safety. "Our rail fares are already the highest in Europe and today's increases will only make that record worse," he added. 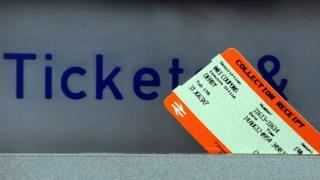 "It's time that ministers gave rail passengers a break and actually froze fares in real terms." The union-led Action for Rail group said it was planning to stage protests at a number of stations in England, Scotland and Wales on Tuesday. Labour leader Jeremy Corbyn has pledged to extend public ownership of the country's bus networks if he becomes prime minister. Both he and his rival in the upcoming party leadership contest, Owen Smith, have said they would renationalise the railways if they won power.